Sometimes digital copies of movies are a bit too expensive to enter the ol’ credit card number, but sometimes they’re priced just right. Right now Vudu has a sale on six blockbuster films that can be added to your digital collection for just $4.99 each. And, the films are offered Vudu’s HDX quality that’s formatted in 1980 x 1080 video resolution. 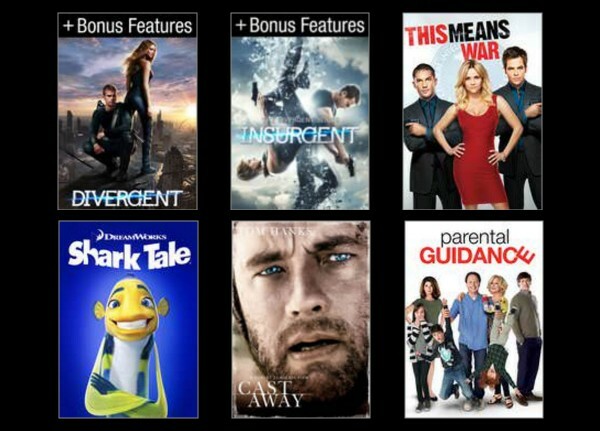 Vudu’s sale titles include Lionsgate’s Divergent and Insurgent, both of which include bonus features such as behind-the-scenes content, story development, and character featurettes. DreamWork’s animated hit Shark Tale starring Will Smith is also on sale, as well as the Tom Hanks drama Cast Away. Finally, the hilarious comedy Parental Guidance starring Billy Crystal and Bette Midler is also just $4.99 this weekend. What’s great about purchasing from Vudu is the service’s UltraViolet partnership. Vudu, along with several studios including Sony Pictures, Paramount and Universal, are UV partners that share a central database. That means all digital movie purchases and redeemed movie codes with UltraViolet are added to a personal library that can be accessed through multiple websites and apps.